Si has suggested - and as he is not only a Moderator but a Super one at that, who am I to disobey! 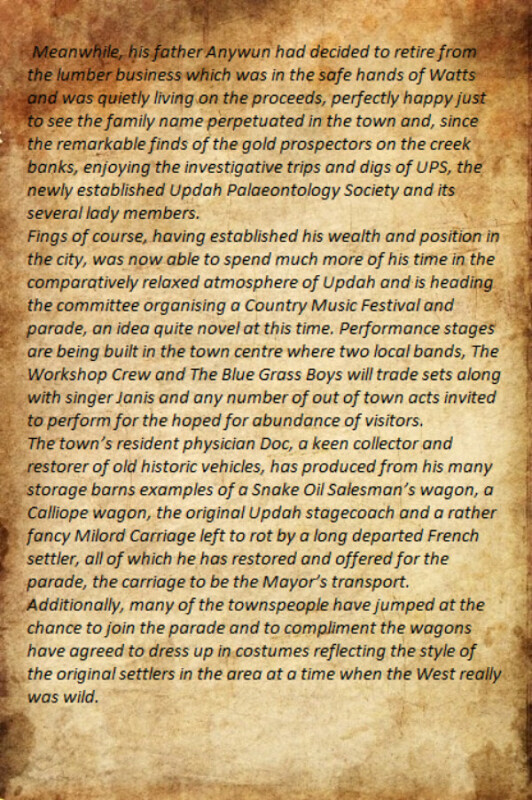 - that I post information on my first and only On30 layout, Updah Creek. So first a little background. 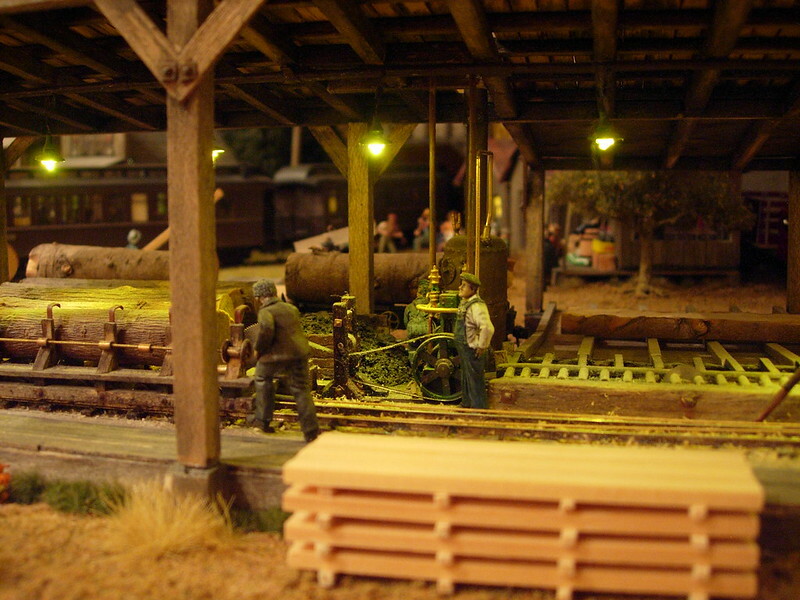 It's been three and a half years in the making to date so by no means a new build so I'll try to show "before and after" images rather than replicate the 309 pages of posts on Narrow Gauge Railway Modelling Online forum and risk boring everybody to death! Secondly, it's simple imagineering as I'm a Brit and I've never had the privilege of visiting the USA or Australia from which continents any inspirations have been drawn and my knowledge of said territories is limited to what I saw in the Saturday morning movies as a kid back in the 1940s and '50s. Thirdly, I'm not a club person so tend to rely on inspiration and guidance from forum members who are in the main far more knowledgeable than me. So, on to Updah. 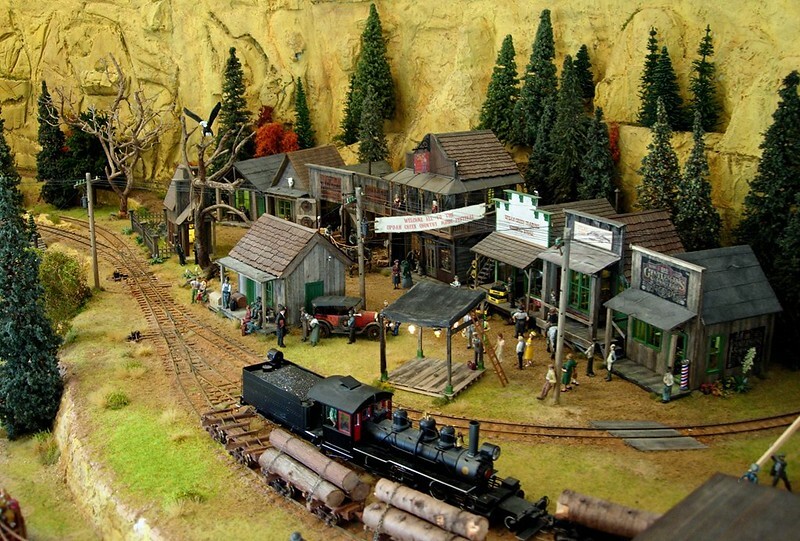 I had in my mind a backwoods small town setting with employment from a sawmill, a creek fed by a waterfall and a trestle on a grade crossing the creek. 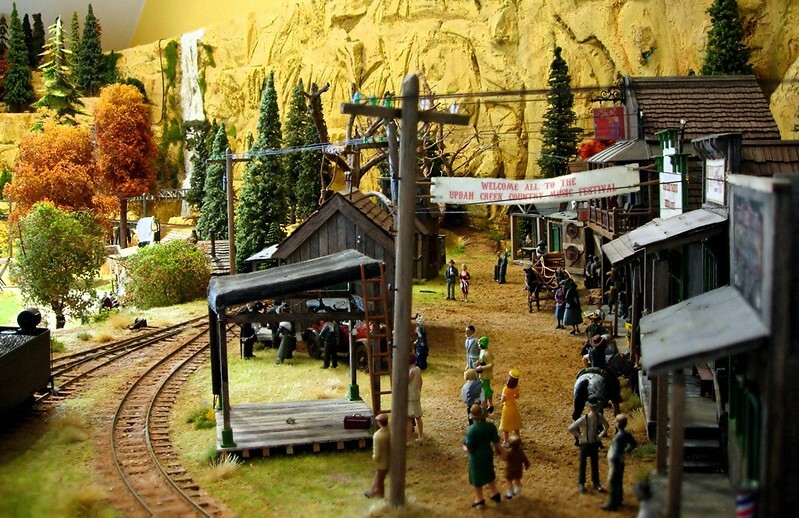 The trains would run on a "roundy-roundy" circuit with a spur leading off to a service, maintenance and refuelling area and to liven up the atmosphere in town it would be staging a Country Music Festival to attract visitors and their purses for the benefit of the local tradespeople. 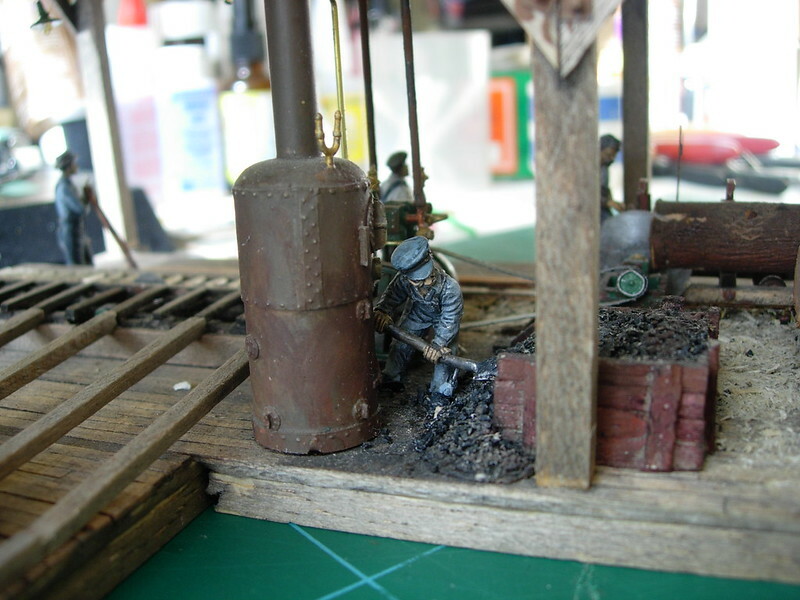 Resources came from recycling a previous 009 scale layout's baseboards (I had to go up a scale having discovered that eyesight and dexterity do not improve with age!) 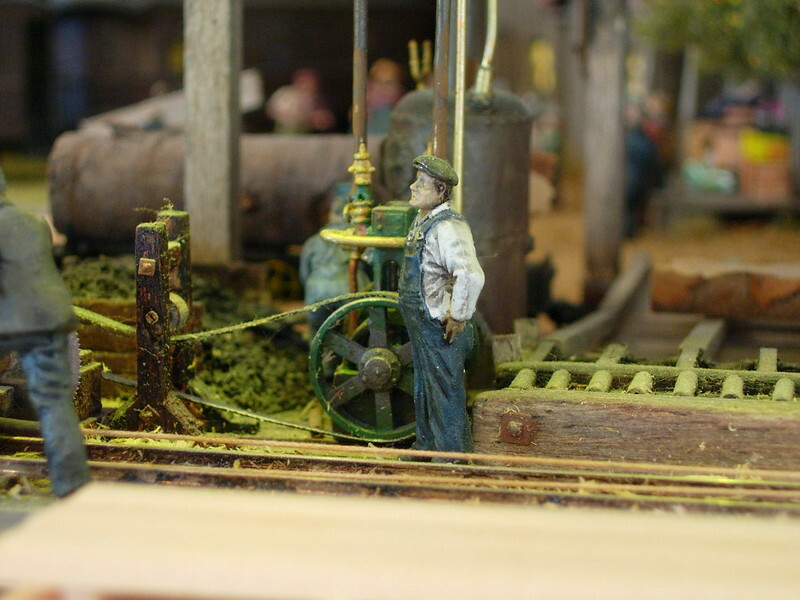 and the sale of the locos, rolling stock, buildings, little people and some of the electrickery from that. I also discovered the benefits of foam board as a basis of a lightweight baseboard and lucked in on an eBay seller in Cornwall who, as a surfboard maker had a substantial stock of inferior grade 3" thick board he could not use and wanted rid of. 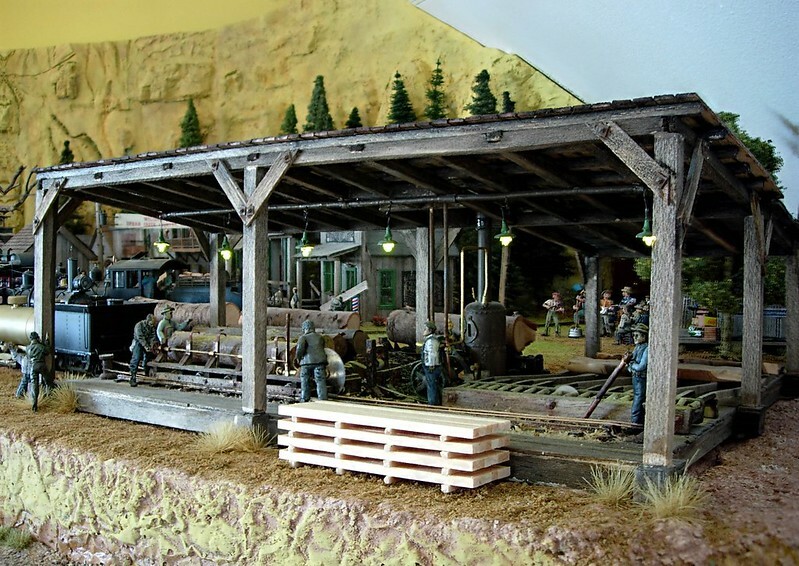 This coupled with the seemingly endless supply of relatively inexpensive Bachmann motive power, much of it second hand, ME track, thousands of wooden coffee stirrers for almost no money again from eBay and an existing supply of scenic material got me started. So without much further planning, building began and started more or less as this. As boredom thresholds must have been reached by now, I'll finish this post and see how things go! That's a lovely layout! If I could make a request though, please show some detail scenes. I can't see all the details that well, but it looks like you've got a lot of interesting little scenes spread throughout the layout. But hey, looking at the view from a few feet away shows a very fine layout. after having been doing some aiding and abetting (aka "long-range" encouragement) of "Updah" and its progress on another forum, all I can say is that we are in for a visual feast here that will extend for a while into the future as Doug unveils what is a "modelling masterpiece" purpose-built into a rather difficult area to use. For Doug - watch out for the Moosies on this forum. I predict that there is going to be a whole herd of them heading your way once the details of the motive power depot, the town's history and all the other stuff that you have running on rails start to emerge from behind the morning mist shrouding Updah. 'Updah' looks totaly AWESOME ! ...and a huge forest on the mountain grew in an instant ! I can see a ton of interesting looking structures there Doug. Looks like you extended the left side, for a yard area. On the right side, a kinda loading area. All will be revealed I'm sure ! Looks like an interesting track plan ! Kinda 'roundy point to point' by the looks of. Clever stuff in that space, with bone-loop. 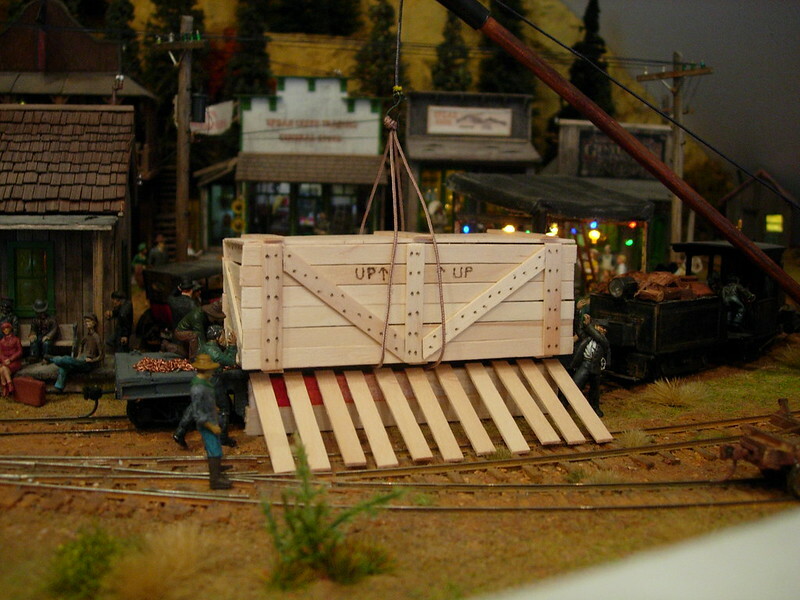 Looks like you could have a train on the loop, whilst switching both yard & loading area. Sorry Doug, my mind always jumps tooooo far ahead ! Can't wait for more ... More ! ... MORE !! Damn creek was a signwriters nightmare. Really UPDAH on that one ! Thanks chaps, you're most kind. I hope you think it's justified later on! 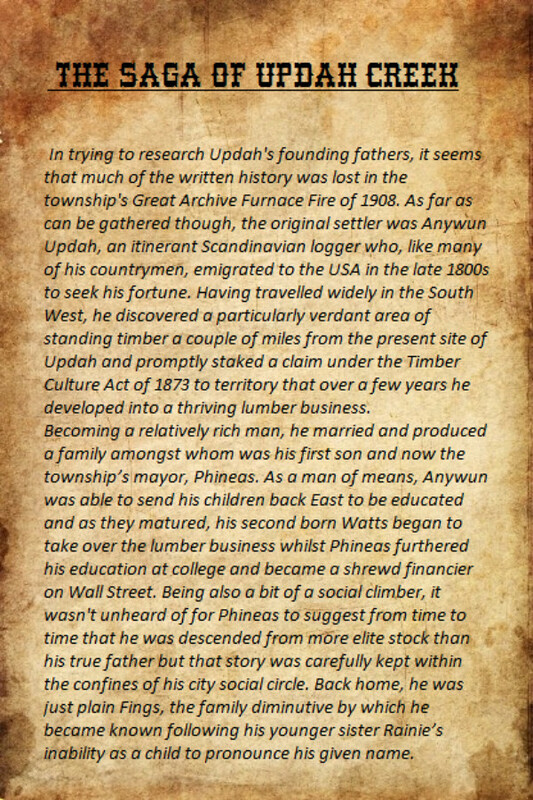 I thought that, even though it's possibly too much text and not enough pictures, an introduction to the history of Updah and its characters might be helpful to put various scenes into context. 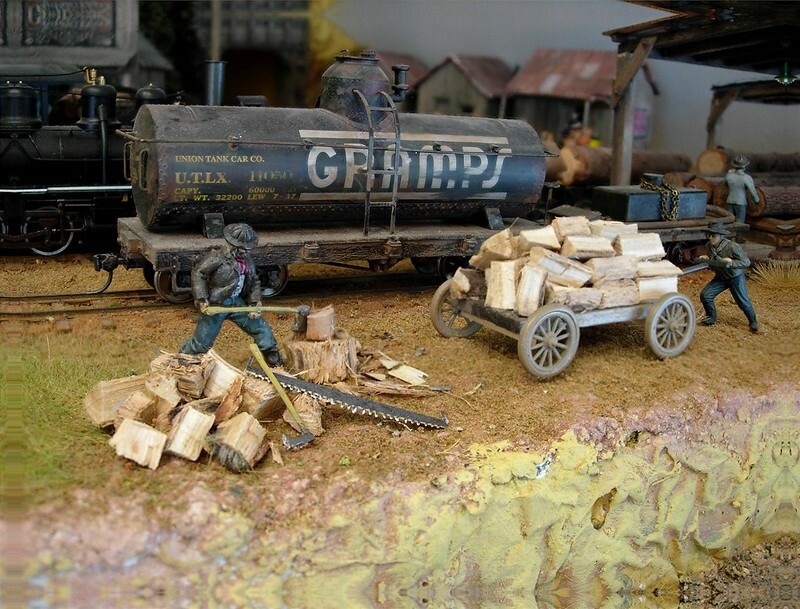 Rummaging around when contemplating the possibilities of the layout I was fortunate to come across some old papers which had a tale to tell and which I share with you below. 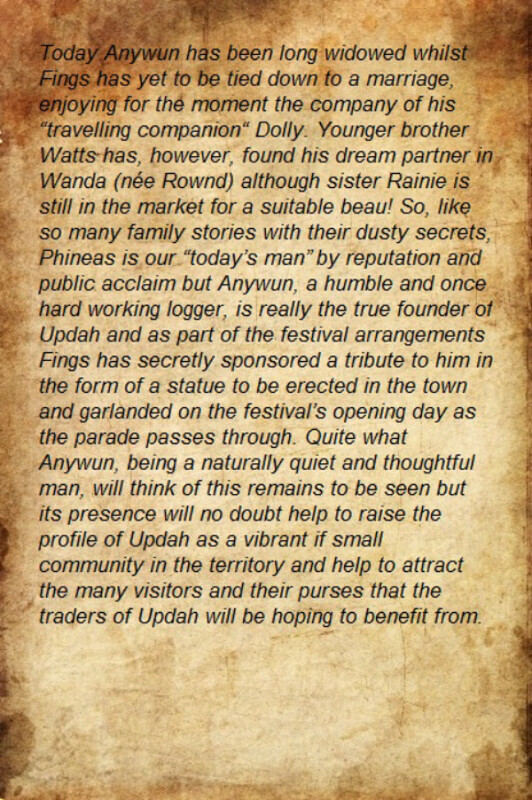 And this is the statue of the town's founder, Anywun Updah, erected as a tribute by his son Phineas (Fings) and supplied and crafted through the generosity of Ken, NevadaBlue of this parish. 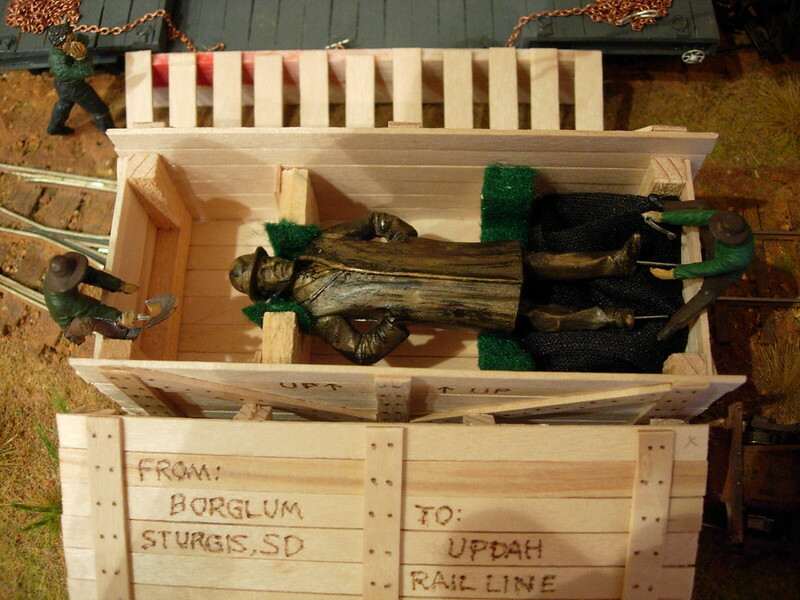 Coming to Updah all the way from Nevada by rail, it arrived beautifully crated complete with its own three legged hoist for loading and unloading and was the scene of an unpacking ceremony overseen by Phineas in front of the town station. So the saga begins and more anon! Wow, I'm very impressed. Please, show us more! Thanks Lee and I'll try to follow the sequence in the "research material" as far as I can. 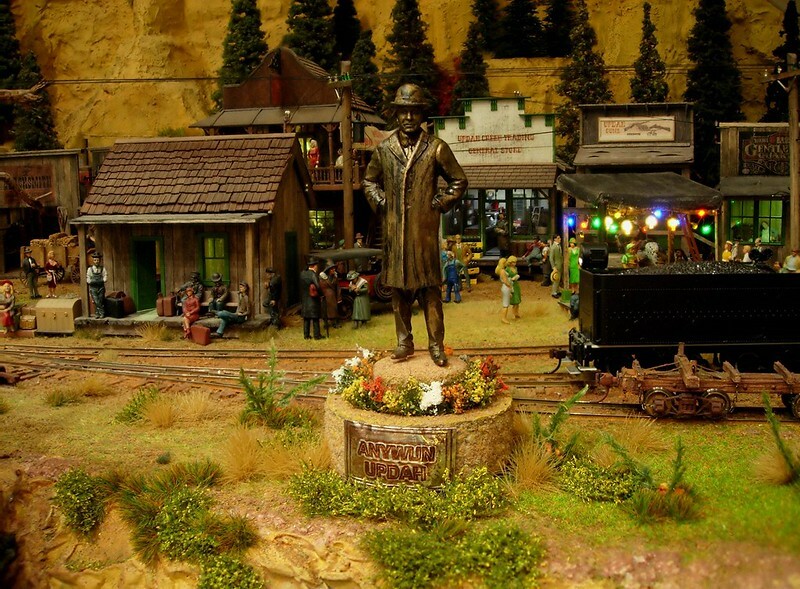 I've also been following the developments on The Stoney Creek Branch with great interest as it's fascinating to see how an American local builds a layout compared to a distant Brit. I'm looking forward to this - Don't be surprised if this thread takes different twists and turns than your NGRM thread. Some of the "regulars" and "irregulars" around here are bit "bent and twisted"
I'm looking forward to future instalments of the 'Chronicles of Updah"
Thanks John and I'm a bit bent and twisted myself. Mind you, being a grumpy old pensioner I tend to put that down to attitude rather than age! 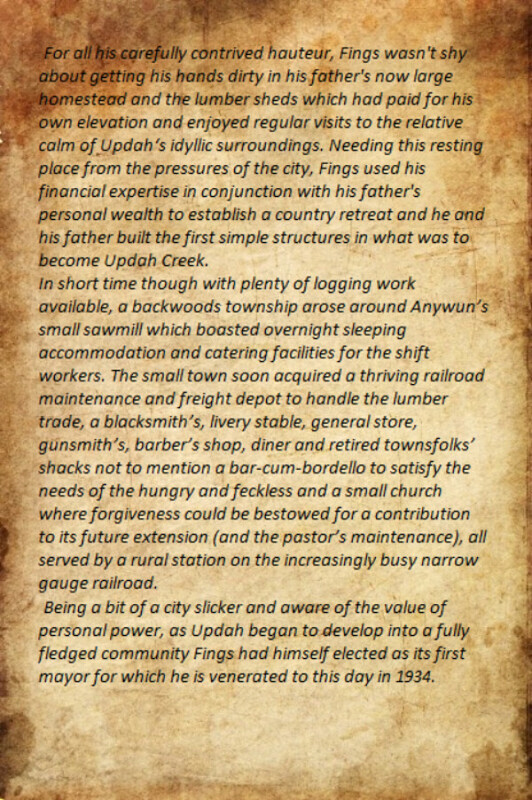 The Updah family's wealth and the township's employment is largely due to the small sawmill. 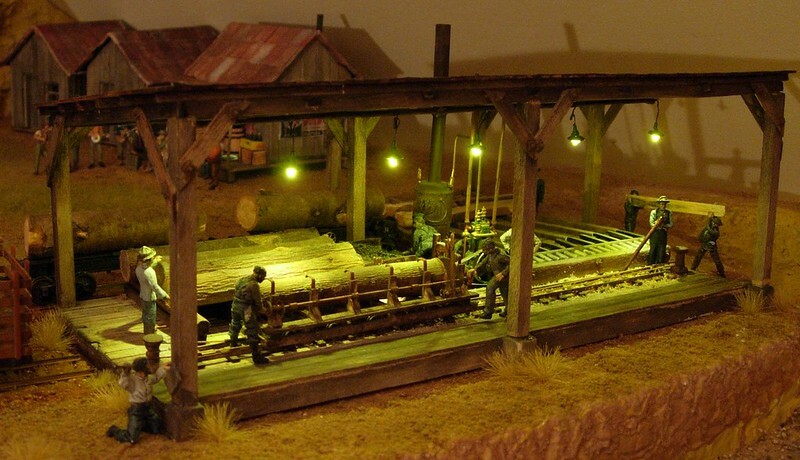 It's workings are based on a modified and upgraded Ozsteam kit http://www.ozsteam.com/html/on30_sawmill.html with the surrounding structure built with balsa and wooden coffee stirrers stained with an Indian Ink/IPA brew, Grandt Line NBWs and 0402 SMLED lighting. with the boiler kept topped up. 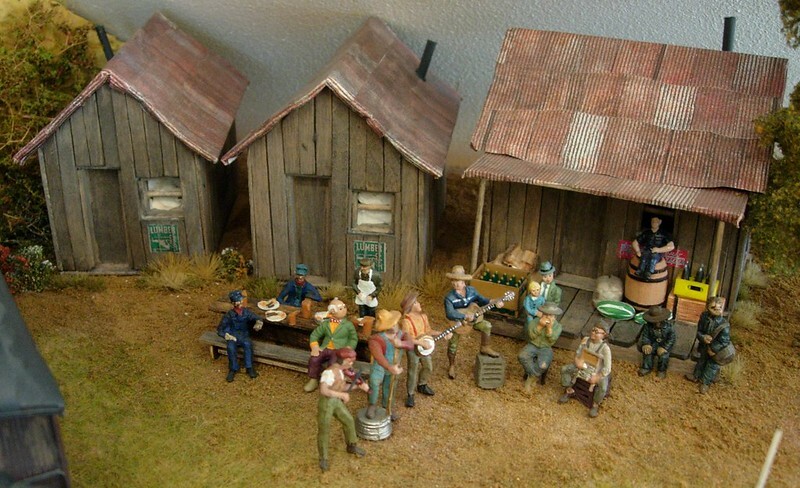 while the rest of the crew adjourn to the mill's canteen and overnight rest shacks (courtesy of Ronnie D of this parish) to be fed and listen to The Blue Grass Boys rehearsing for the Country Music Festival. 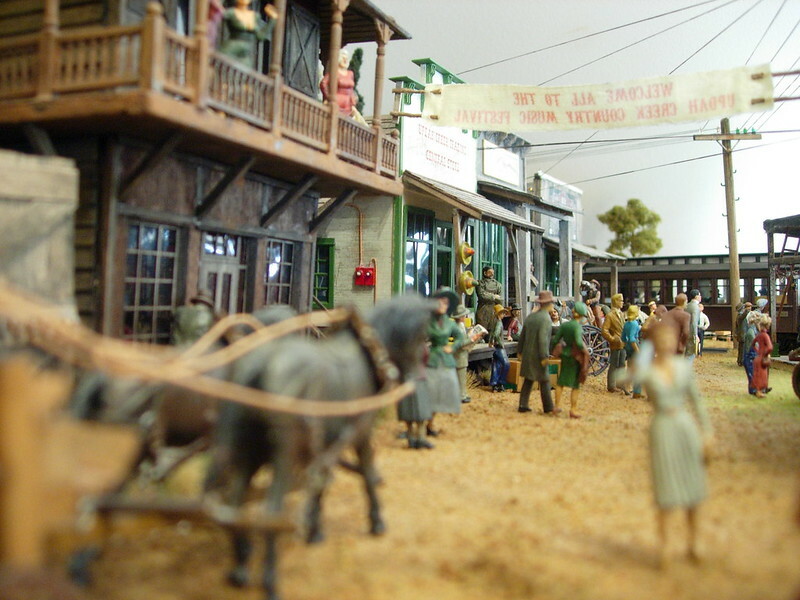 Before talking about individual buildings, I thought a few views of the township's main street might put things into context. 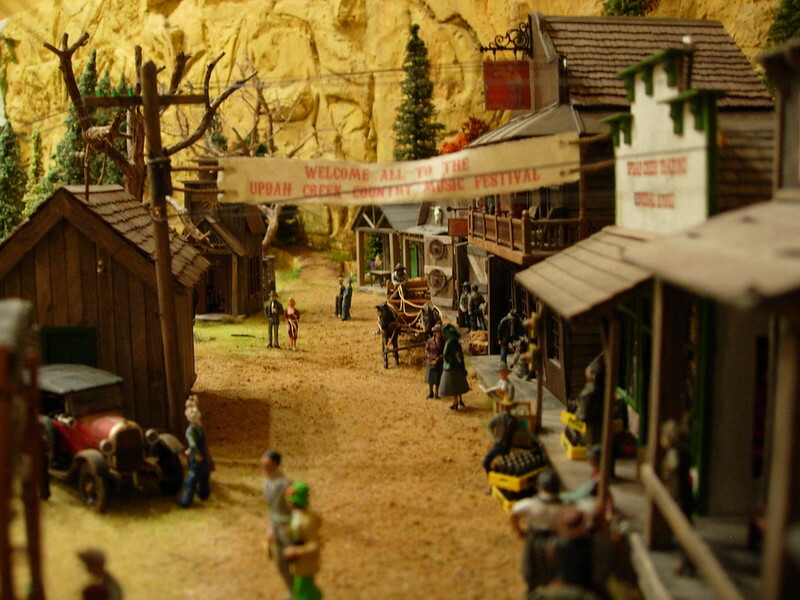 The buildings on one side comprise the barber's shop, gunsmith's, general store, The Painted Lady saloon, livery stable, blacksmith's and residential shacks. 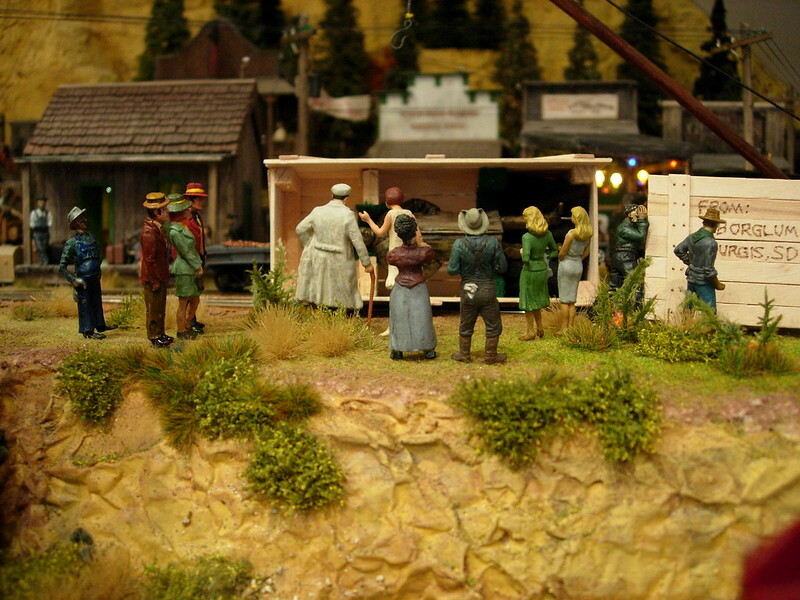 On the other is the station halt, the small church and the stage for the country music festival acts.